Colored YETI® tumblers make advertising a breeze! 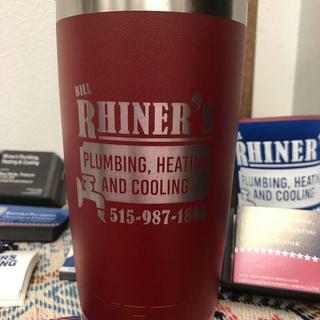 Great for gifts, resale, raffles, and more, these custom YETI® tumblers will advertise your message for years to come. The YETI® Rambler is made of 18/8 kitchen-grade stainless steel, has double-wall vacuum insulation, a No Sweat™ Design and includes a slide lock lid which will keep your drinks cold or hot even longer! This was picked because of the size, it's easier to hold and less likely to fall over. The 20 oz is easier for most people to hold than the 30 oz.